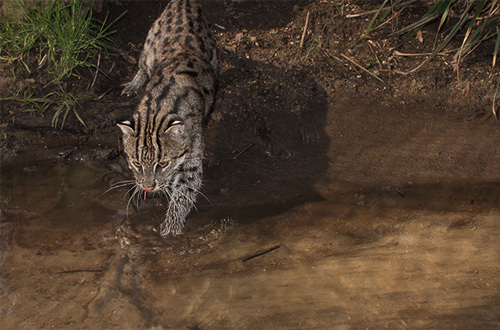 Across their range, fishing cats occur in coastal and inland wetlands, near rivers and streams, in marsh areas, reed beds, tidal creeks and mangrove forests. Fishing cats feed on fish, small mammals like rats, shrews, bandicoots, mouse deer’s, birds, snakes, and crustaceans. These cats has partially webbed paws with retractable curved claws to scoop fish and paddle in the water when hunting. Short muscular tail help to change the direction while they swim. They are also able to swim underwater to prey on ducks and other aquatic birds. Sometimes they have enough strength to lay down dogs and other domesticated animals. Fully grown male is about 70-76 cm in length and weigh about 8 to 14 kg, whereas the female weigh from 5 to 9 kg. These cats have a long, stocky body, relatively short legs than other wild cats , a broad head, round ears, and a short tail. The coat is a olive-gray fur and covered with black colour unique spots and stripes. They can be distinguished six to eight black lines starting from forehead and runs to the beginning of the shoulders and short but slender tail with incomplete dark bands. The double coated fur has water resistant ability that is important to keep the body dry while diving into the water to catch fish. They are also nocturnal. They can be found in the Sri Lanka, Himalayan foothills, East coast India, Nepal , Malaysia, Bangladesh and Cambodia. Across their range, fishing cats discontinuously occur in coastal and inland wetlands, hill country rain forests near rivers and streams, in marsh areas, reed beds, tidal creeks and mangrove forests. . More recently, they have also been recorded in degraded habitats in the Ganges Delta and near aquaculture ponds in the Gulf of Thailand. In Sri Lanka, they can be found in Costal marshlands, wetlands, Mangroves , associated habitats of rivers, tanks, streams and hill country rain forests. 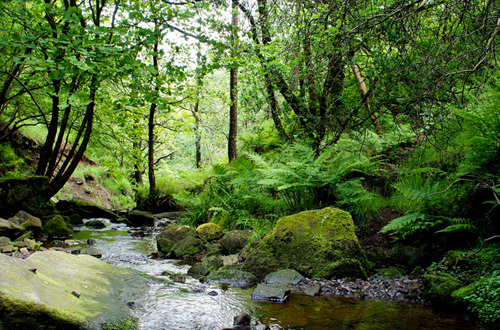 They are a Wetland specialist and the flagship species in fragmented water rich habitats. Throughout the world, all of the wild cat species are in danger and threatened. Although many people work on large cats, only few people work on small cat conservation in the world. Hence we stood up in Sri Lanka to conserve our precious small cat species focusing on fishing cats.